Can I Place Pavers Over a Lawn? Pavers come in a variety of shape, sizes, and material. Used to make deck floors, walkways or steps, pavers are made from cast concrete, natural stone, over-sized bricks and even plastic. Square and rectangular shapes are used for floors, but when used in a walk the pavers can take any shape, including circles. Often times the easiest way to place pavers is just to lay them over the lawn. A walkway made of individual pavers is usually an all-day task to put in. The ground is dug out for each individual paver, and then tamped down to firm the soil foundation. Often sand or gravel is put at the bottom to provide drainage, and the paver is inserted into the hole so that the top of the paver is level with the grass. This provides a walkway that is easy to maintain and lasts for decades with care. A temporary walkway, or one that is not used that often, may have the pavers set directly on the lawn grass. This takes only minutes and involves no digging. It is important to have the pavers match the stride of the primary user so the possibility of tripping on the paver is minimized. Have the person walk across the area and note where his feet fall. Match each footstep up with a paver. Pavers can also be laid directly on a lawn in an area where the water table keeps the ground wet. Inserting the pavers into the ground will only ensure that they too become covered with water during a wet period. By allowing them to ride above the ground the top of the paver is above the water. Over a period of several years the paver sink into the moist ground and needs to be reset on top again. Above-ground pavers make mowing the area more difficult as the lawn mower must move around them. A string trimmer works best when edging the grass around the pavers. If the pavers are meant to be temporary but are left on the lawn grass for too long, they kill the grass underneath. 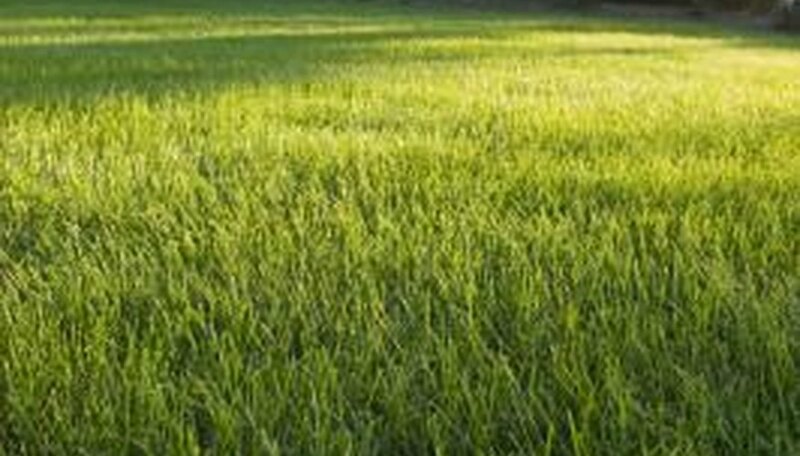 If the grass needs reseeding it can be hard to exactly match the existing grass. Avoid the problem by removing the pavers within seven days of laying them . What Is Good for Cutting Grass on a Steep Slope?